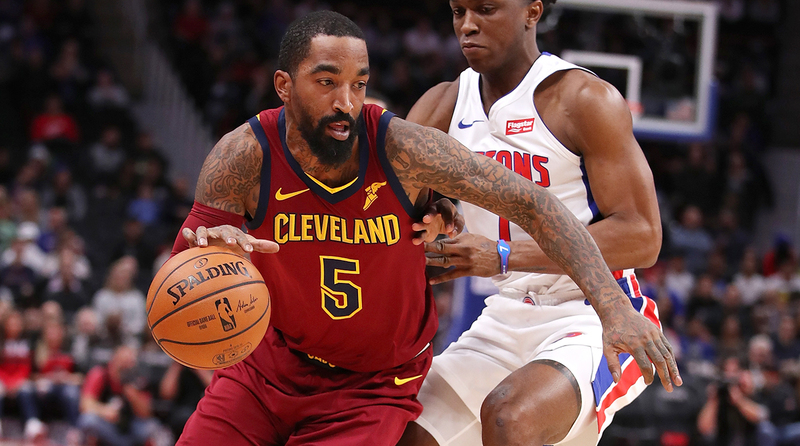 J.R. Smith's time as a Cleveland Cavalier appears to have come to an end. The Crossover breaks down three possible trade destinations. Despite owner Dan Gilbert’s protestations about tanking in 2018-19, the writing is on the wall in Cleveland 15 games into the season. The Cavaliers are 2–13 to start the year and on a fast track to the top of the draft lottery. Kevin Love is unlikely to return for another month. Jordan Clarkson leads the team in usage rate. Even compared to the dregs of the East, the Cavaliers possess the most tanktastic roster in the NBA. J.R. Smith recognized as much once the season began. The mercurial shooting guard has expressed his wish for a trade multiple times this season, and got his wish on Tuesday. The Cavaliers will seek a trade partner in the coming weeks, playing without Smith as he works out away from the team. We shouldn’t hold much sympathy for Smith. His effort in Cleveland has ranged from respectable to shameful, a mixed bag both in the regular season and playoffs. Smith was instrumental in Cleveland’s Game 7 victory over the Warriors in 2016, most notably canning a pair of threes to cut Golden State’s lead from eight to two in the third quarter. Two years later he crippled the Cavaliers’ chances of stealing a Game 1 victory in Golden State, making one of the most boneheaded gaffes in NBA history by dribbling out the clock at the end of regulation. It’s been the same recipe for over a decade: J.R. Smith giveth and taketh away. The market won’t be robust for Smith, but a favorable contract should lead to a team snagging him ahead of the buyout market. So who could be in line for Smith’s services for the rest of the season? Here are three potential destinations. Houston is still bereft of shooting on the wing after the Carmelo Anthony experiment failed, relying on a significant dose of James Ennis, Gary Clark and Gerald Green to fill in the cracks off the bench. Eric Gordon should progress from his putrid 24.8% mark from three to start the year, but as it presently stands, Houston would benefit from an added three-point gunner to round out its roster. Smith isn’t a creator. He works best as a spot-up artist, hoisting jumpers in a hurry on the wing or in the corner. Smith thrived playing with LeBron and Kyrie Irving, two players who drew significant help from opposing defenses before slinging it out to open shooters. James Harden and Chris Paul serve a similar role. Harden in particular has become one of the NBA’s premier passes off the bounce, able to toss assists with either hand at any conceivable angle. That wasn’t the case early in his career. Smith would get flashbacks to his glory days in Cleveland playing with Harden and Paul. Houston is presently No. 23 in three-point percentage and No. 26 in points per game. Smith’s instant offense would provide a remedy to some of the Rockets’ scoring woes immediately. The Thunder seem to follow the same playoff path each year in the post-Kevin-Durant era. Oklahoma City competes and even succeeds when Russell Westbrook is on the floor, only to squander any semblance of a lead whenever the seven-time All-Star heads to the bench. And unless the Thunder undergo a roster overhaul before April, they look destined for a similar fate this postseason. Oklahoma City’s bench lineup is a motley crew at the moment. Their reserve wings consist of Terrance Ferguson, Alex Abrines and rookie Hamidou Diallo, none of whom should be trusted for significant postseason minutes. Abrines is the best shooter of the trio, but Smith provides an extra dose of athleticism, even at this stage of his career. Postseason rotations aside, Oklahoma City currently sits last in the league in three-point percentage. Not one Thunder player averaging 10-plus minutes per game is shooting over 36% from three, a mark Smith has cleared in four of the last five seasons prior to 2017-18. He’d be a reliable cog next to George and Westbrook come playoff time. Speaking of teams that could use a shooting boost, perhaps Smith could take the three hour drive up Lake Erie and join the Pistons. Blake Griffin has carried Detroit to a respectable 8–6 start, but his career year has masked the Motor City’s miscast roster. Outside of the Griffin-Andre Drummond duo there’s not much to like. Reggie Jackson continues to eat up possessions with an ugly shot profile, while the Reggie Bullock, Langston Galloway, Stanley Johnson trio has combine to shoot just 32% from three. Expect Bullock to find his groove sooner than later. He’s proven to be an efficient launcher in the past, shooting a combined 43% percent from three from 2015-18. Galloway and Johnson, not so much. Dwane Casey has turned around Detroit’s culture after a tumultuous 2017-18, and should get the best out of Smith. New scenery and a chance at playoff competition will boost Smith’s production, as will the rediscovered playmaking duties of Blake Griffin. Detroit trails only Oklahoma City in three-point percentage. Smith could help bring the Pistons’ shooting from dreadful to respectable.